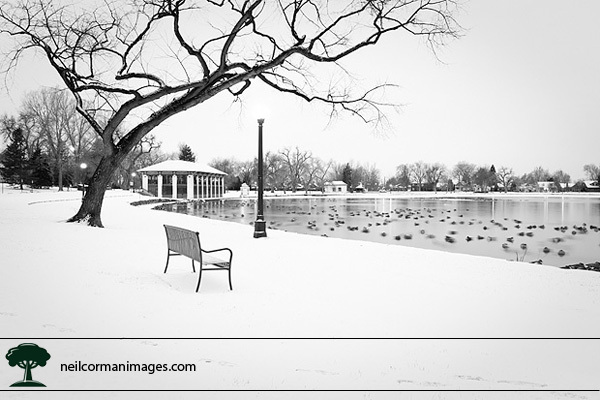 Last week in Behind the Picture, I featured Snowy May Day which is a photograph of a tree in Denver’s Washington Park. This week the same tree is featured however with a little different look. You may recall the original image was in May during a late snowfall and it showed the grass in various locations. In early 2009, after an overnight snowfall I decided to revisit the location in Washington Park and capture the same tree but in a different season. Arriving before dawn, I made my way over to the location on the slick snow and ice and set-up for the image. Once I captured the same image as before, I decided to move around a little bit to try a few different perspectives. One challenge in this was to not create too many tracks in the snow as I was not sure if a shot would be using the snow in one location as an element to the picture. As I moved to the right, I liked having the boat house in the image and worked to capture the stillness of the morning. As people were out jogging and walking in the park, bringing in the tracks along the bottom of the frame became an important element as well as capturing the motion of the ducks. This motion from the ducks helps convey the time element of the Morning in Washington Park.